Anverso Efigie de la reina Elizabeth II con las palabras "Elizabeth II Australia 2 Dólares 2 oz 999 Plata 2019"
Efigie de la reina Elizabeth II con las palabras "Elizabeth II Australia 2 Dólares 2 oz 999 Plata 2019"
Moneda de plata Año Lunar del Cerdo 2019 de 2 onzas de la Casa de la Moneda de Perth If you’re looking for the internet’s best price, be sure to order your 2 oz 2019 Perth Mint lunar Year of the Pig silver coin from our online shop today! The staggeringly successful Lunar Series II from the Perth Mint concludes with the Year of the Pig, as assigned by the Chinese Zodiac. The reverse feature is, of course, the buxom pig, depicted as a sow and piglets going about their business, under the shade of a stylized tree branch. The Chinese character for Pig is also displayed on the reverse, as well as the coin’s title, all encapsulated by a narrow border. The coin’s obverse bears a high detail effigy of Elizabeth II, artfully portrayed by artist, Ian Rank Broadley. Also on the obverse, the country and year of origin, Elizabeth II’s name, details of weight, content and purity and, finally, the coin’s unique face value. 2019 will be the year of the earth pig in the Chinese lunar calendar, there are, in fact, five types of pigs, each assigned a unique element and each symbolizing slightly different character traits. 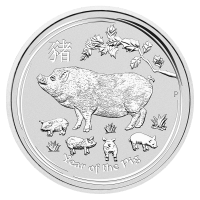 Buy into this acclaimed series before it concludes, diversify your holdings with a 2 oz 2019 Perth Mint Lunar Year of the pig coin today!